This week I was speaking to a radio station about the new Apple Watch while stuck in Berlin airport following the 're-launch' of Cupertino's new wrist dweller. While trotting out the same answers about smartwatches I'd offered to countless media outlets (yes, they're too expensive, and no, they don't do enough yet) the DJ asked something that made me pause. "So Apple is marketing this as a fitness device, right?" he belted into his microphone. "Why would they do that? It means the likes of me, who doesn't want to get fit and has no intention of doing it, simply won't buy it!" And he was right. Smartwatches right now are no good for a lot of things, least of all running. And yet this activity is something Apple is pushing hard to associate its brand with, parading the likes of Christy Turlington Burns as one of the faces of the new Watch. It showed her completing half marathons with a thing that really is no more than a gadget-ised fashion accessory strapped to her wrist. The Apple Watch doesn't have GPS, it can't structure training plans to get you fitter, and the battery will last as long as a chocolate roll at an eight-year-old's birthday party. It's not in the same league as dedicated running watches by any stretch of the imagination, so for the enthusiast it's a non-starter. And for the runphobic, the Apple Watch has been presented in a way that doesn't feel inclusive by making such a big deal about the health benefits - if anything, it's saying 'if you're not going to fill that 30 mins of exercise ring each day, don't bother coming putting me on'. While Apple doesn't need any pity given to it, the brand is in the same boat as all of the other smartwatch manufacturers: the batteries aren't big enough, the sensors are too large to fit in a slim design and everything costs too much. Really, they should have all waited a couple of years to perfect the tech before getting it out into the wild, but such is the feverish excitement to make a thing a THING before someone else makes it a THING that stuff gets pushed out prematurely. 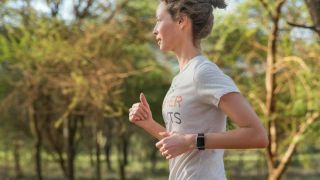 The same will go for the Apple Watch, still almost certain to be the world's best selling smart watch in a couple of years even with the high cost and limitations on tech, by the fact 'the best running watch is the one you have strapped to your wrist'. The battery life will improve rapidly, the sensors will miniaturise to the point where we'll have cadence, speed and elevation alongside the pre-requisite GPS. And, most importantly, developers from Nike, Adidas and Strava and a host of others will get their claws into the popular platform, making some truly great apps that will outstrip even what's available on phones and bringing the experience only available to expensive running watches to do-it-all smart ones. Because that's how we have to think about it: Apple will, Trojan-like, bring a powerful running watch to the wrists of millions, those that just bought it because it was a cool Apple thing. Think about how many people you know that have started running and are using a smartphone to help them do it - and imagine being able to do that without a cumbersome and ugly arm strap. While the Apple Watch will always be too expensive for some, and the current Apple Watch Sport seems to be there in name only (plus an easy way to make people feel better for dinging it up a little, because Apple has dubbed them an ACTIVE PERSON), the future looks a lot better. Should runners buy an Apple Watch this year? No way. For the same price you can get something hugely more useful from Garmin, Polar or even Adidas. But don't be surprised if you start seeing Apple Watches on the arms of competitors in 2017… or even on your own.